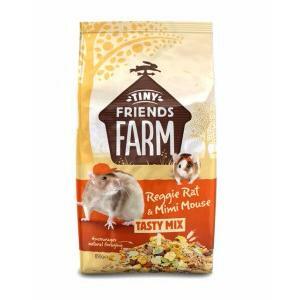 Supreme Reggie Rat and Mimi Mouse is a nutritionally balanced, tasty mix suitable for rats and mice of shapes and sizes. At the Tiny Friends Farm in Hadleigh, Suffolk, Supreme believes that the very best food should be nutritious as well as oh so delicious. Our food encourages natural foraging, and is perfect for tiny friends with big personalities. Delicious ingredients such as maize, oats, wheat and peas, as well as added vitamins provide a tasty everyday diet that helps promote your pet’s natural wellbeing and vitality. We’ve also added tasty linseed to help keep your pet’s skin and coat in the very best condition.